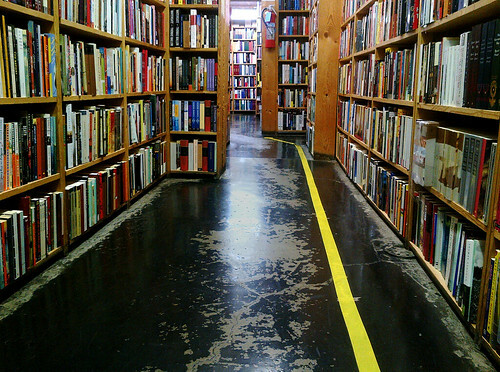 Seminary CoOp Bookstore, Chicago, a photo by Edith OSB on Flickr. The Seminary CoOp Bookstore is a wonderful underground maze of twisty turning passages with books from floor to ceiling. No subject, from abstract mathematics to art, is beyond this collection. The Sem CoOp can be counted on to put forward books I haven’t heard of but want to read as soon as I see them. The Seminary CoOp Bookstore will be moving to a location a block away. I haven’t seen photos, but I’m sure the space will be more adequate – wider aisles, better ADA compliance, perhaps even more room for display. Nonetheless, I have trepidation that the intense intellectual fervor that marked this first store won’t survive in a well-lit airy location. But I may be wrong. They may have located another warren of twisty turny passages and I’ll feel right at home.